Nathan had been involved in the financial services industry for 10 years at the time he joined Elders in 2006 as a general insurance agent. Having lived in Mt Gambier all his life, he maintains strong links to the community advocating for additional multi-sport recreational facilities, coaching and mentoring young footballers as well as raising funds for the Mount Gambier Hospital Paediatric Unit, Royal Flying Doctor Service and McGrath Foundation. 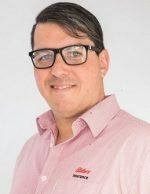 As an Authorised Representative, Nathan believes in motivating his clients to clarify their goals, employing strategies that will explore their earning potential during their working years, as well as helping provide the protection they need to ensure they do not place their long term financial goals at risk. He achieves this by empowering his clients to take control of their financial situation through education and mentoring and an ongoing support program to help achieve peace of mind that they are in control of their financial future.